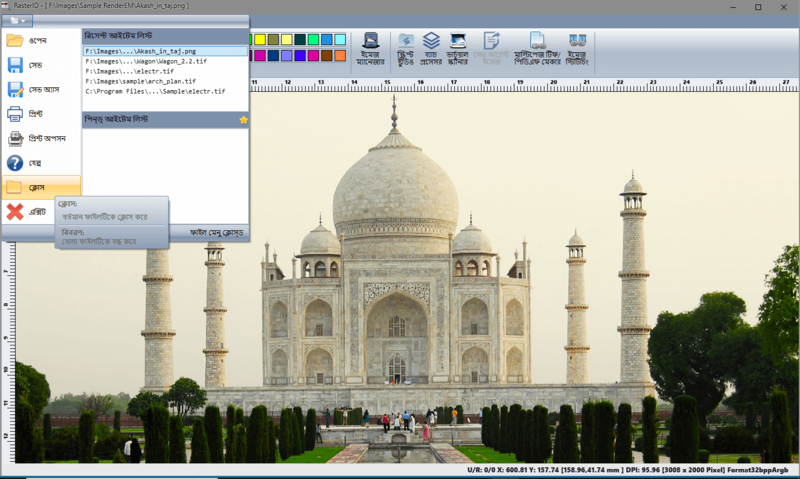 RasterID is an easy to use Image Indexing Software released by CSoft AS. It has been designed to mitigate the needs of a highly versatile post scanning utilitarian tool which is sought to be reliable on one hand and versatile on the other. 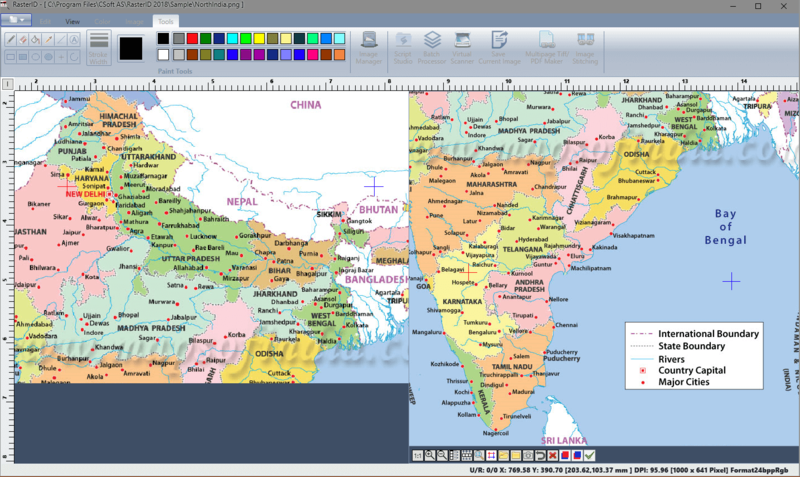 RasterID allows for work with most of the coloured and monochromatic raster formats including TIFF, BMP, PNG, JPEG, JPG and PDF. 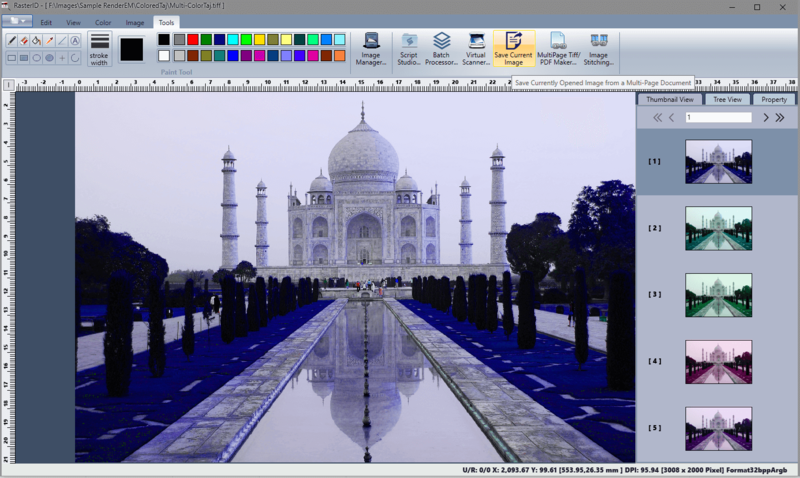 With a huge arsenal of free image processing tools under its disposal, it can cater to almost any kinds of image related operations both for coloured and monotonous images. 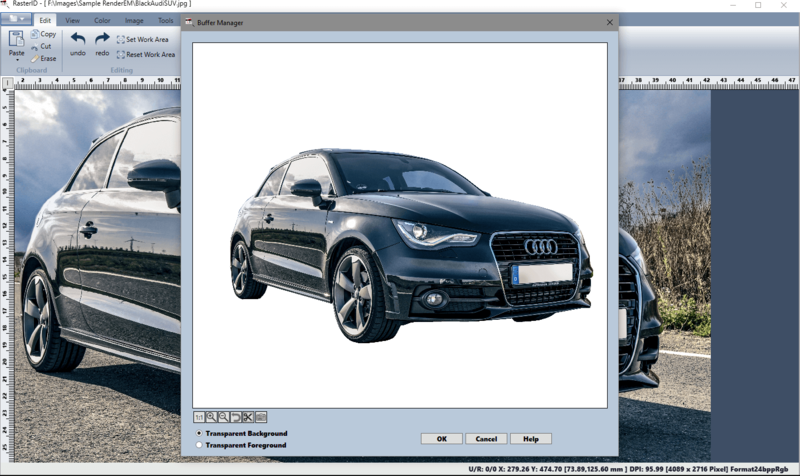 Apart from the manual procedures, this free image enhancement software has a huge array of automated utilities for processing images through encrypted macros/scripts, or for conducting batch operations to minimize unnecessary human interventions. RasterID is focused on the industries like Architecture, Construction, Engineering, EDM, TDM and Facilities Management. RasterID allows for work with monochrome and colour raster images in the following formats: BMP, JPG, JPEG, PNG, TIFF and PDF (raster). It also provides the ability to tune saving settings for several formats as well as to create a custom format based on the existing ones properties of some set a custom format. RasterID includes OCR tools to recognize texts from inside raster images. You can also export the record in multiple formats and databases. 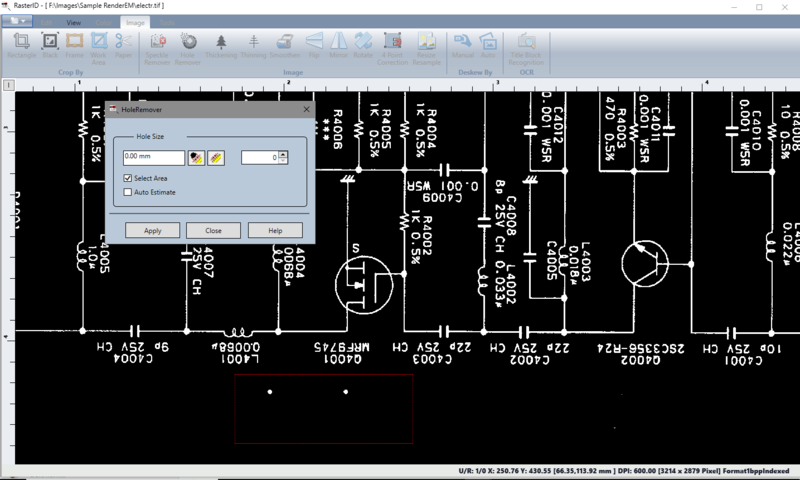 What’s more, you can now create a batch process to recognize all your similar drawings and generate valuable information from raster at one go. OCR information can be saved in a variety of indexed output formats. 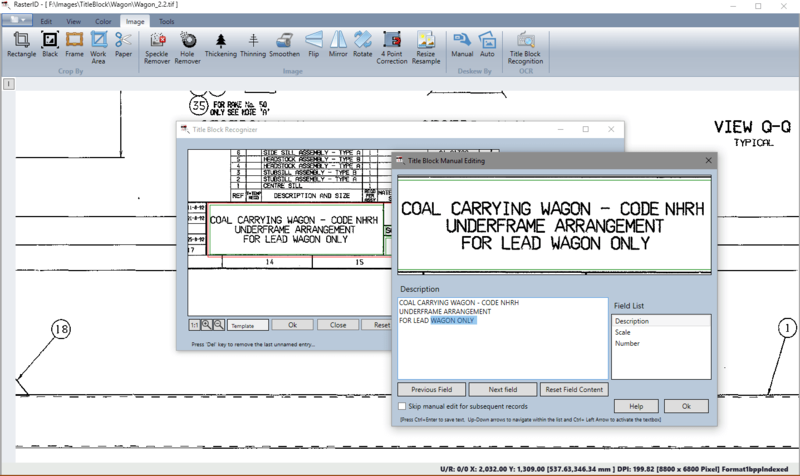 Apart from the inbuilt OCR, RasterID 2018 now incorporates ABBYY Cloud OCR as a new utilitarian tool for people who wishes to integrate ABBYY as their OCR engine for Title Block Recognition. RasterID 2018 now has an innovative way of editing deciphered text manually for Title Block Recognition. Apart from the usual way of recognizing text through OCR Engine, RasterID goes a step ahead and imbibes the software with an additional refining mechanism which allows deciphered text to be manually edited for cent percent accuracy real time. Users now have a choice to save their Title Block indexed output in SQL and MySQL database apart from the pre-existing choices i.e. CSV, Excel and MS-Access output files. Several discrete Images can now be compiled together into a single multi-page PDF/Tiff document. 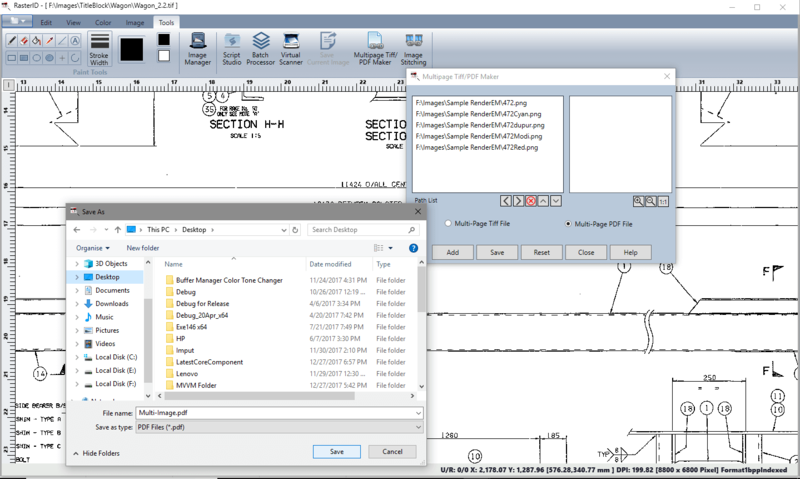 Both Virtual Scanner and Batch Processor now have two additional output types; so that a number of images can be processed simultaneously in batch mode and can be saved in a single multi-page document (PDF or Tiff) as per the user’s choice. In this feature, the user can change the colour of an image file according to their basic requirements. Here the user can select a particular hue & replace it with a different shade altogether. This process is more likely to be used in displaying products in diversified colours and shades. Image stitching is the process to stitch two or more images projected identically on the drawing and having the common reference sections. 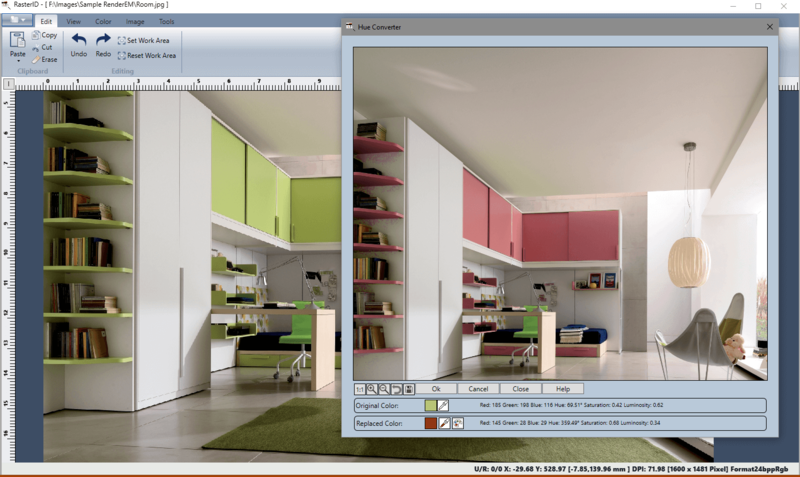 The image processing software has the functionality of two-dimensional stitching which has been incorporated with a view to consolidate two or more sections (snaps or image) of an object into one extended image. Buffer Manager is used to modify or refine a Buffered Image by cutting an irregular portion from the main rectangular Buffer and pasting the outcome into the host image. In order to use the Buffer Manager, the first pre-requisite is to ensure a portion/or whole of an image is actually copied in the buffer. 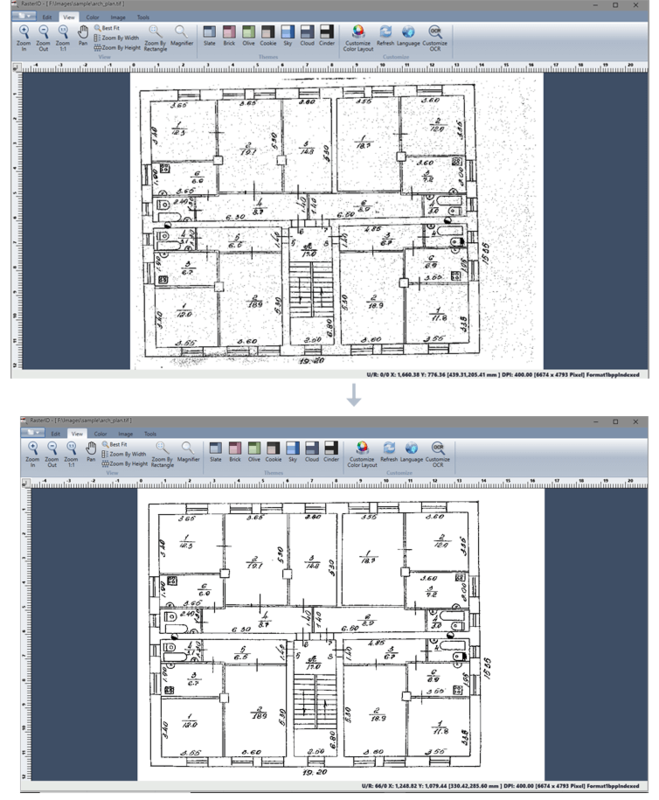 This can be done by copying /cutting a selected portion of an image (set by work area) or the whole image as such. 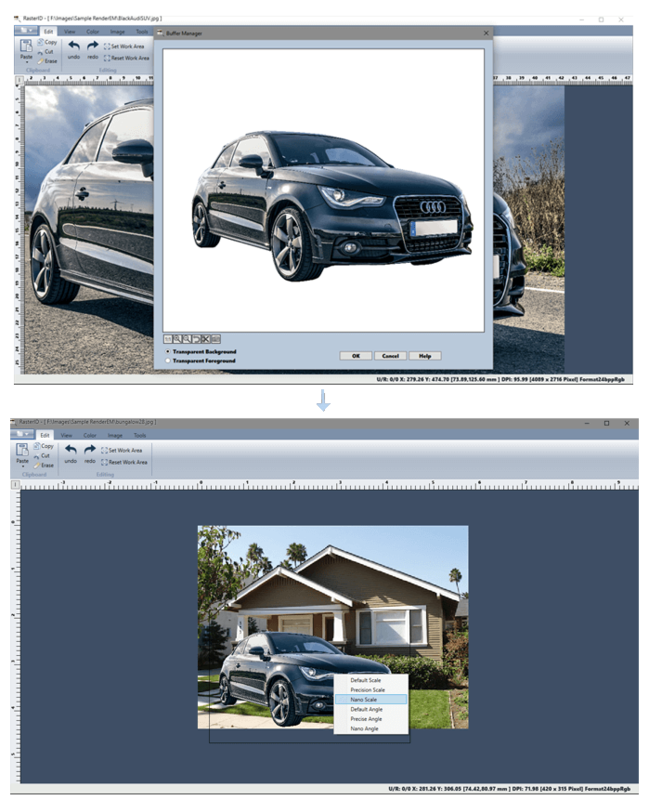 Images/portion of an image copied through RasterID offers a variety of pasting option. Apart from the usual pasting mode (in any position within an image), RasterID also allows the buffered image to be resized and rotated before being pasted. The Speckle Remover filter removes raster objects (isolated clusters of black pixels) whose size is smaller than the specified value in a monochromic (black and white) image. This filter can automatically and manually estimate the size of the spots in the image. If the image does not contain small speckles, Speckle Remover may delete texts, dashes or any small symbols from the image when Auto-Estimating mode is turned on. In this case it is better to use your own specified speckle size setting. Akin to the Speckle remover, the Hole Remover filter fills holes in raster objects in a monochromic image. The filter removes holes (isolated clusters of white pixels) that have a size smaller than the specified value. This filter can automatically and manually estimate the size of the holes. Batch processing makes it possible to apply a sequence of operations to a number of images unattended. This image processing software can automatically process a group of images and then re-save them to the same file or to separate files. All you have to do is create a batch job and then run it. A Processing scenario is a sequence of operations for each image (for example, to increase the image quality). Before running batch processing or indexing user have to create one or more processing scenarios and save them to a script file. In RasterID 2018 it is possible to extract and save a single page as a separate file from a multi-page tiff file or a multi-page PDF file. In order to do this the user needs to click on the ‘Save Current Image’ Ribbon Button. This button only gets activated when a multi-page file is opened in the image editing software canvas. 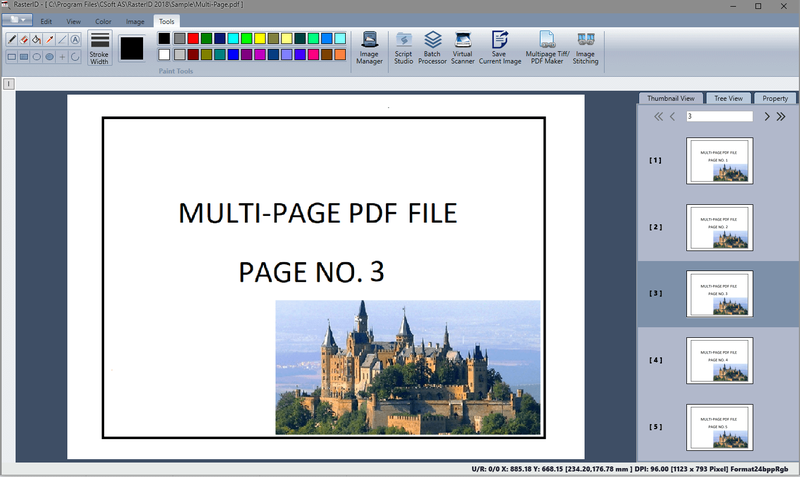 In order to save the desired image, the user needs to navigate and select the proper page from the multi-page document and click on button to save the individual page as a separate file. 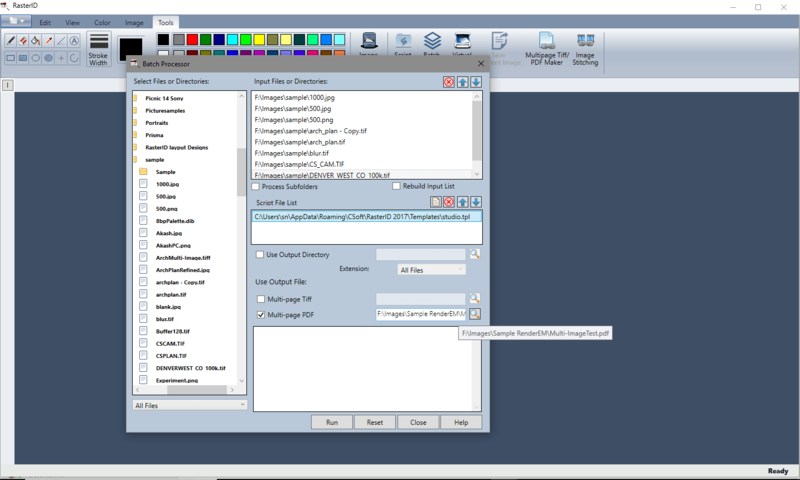 Users can now open PDF (image) files in RasterID as Raster PDF. The images (both single & multi-page) can however be only edited and saved in tiff file format. RasterID now supports localization. 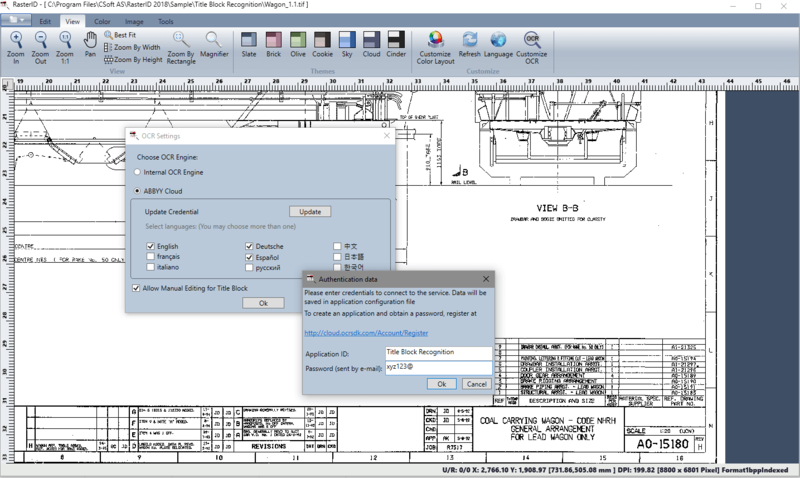 In order to localize the software as per your requirement please feel free to contact us at www.support.csoft.com.